Because it's impossible to know what the playoffs hold. I'm one of those who believe that the baseball postseason is a series of coin flips. I know that's not what any fan wants to hear, but I keep thinking the Braves are overdue to get lucky in October. Watching this team is very frustrating, the Braves are a good team, but lack what it takes to win in the postseason, we are looking at another 1st round exit yet again ... can you tell me why I should feel otherwise about this team's postseason chances Mr. Bradley? I don't think Heyward is an ideal leadoff hitter, but no Brave is. And I do think he has the plate discipline to get on base, which is the point of being a leadoff hitter. He walked his first three times up yesterday against Clay Buchholz. Then again, Buchholz pretty much walked the ballpark. What's your opinion on Heyward as a leadoff hitter? Necessary due to lack of alternatives or does it waste too much of his RBI potential to be worth it? Ben Reiter of SI.com quoted an unnamed scout at the end of April saying Heyward has a hole -- against hard stuff inside -- in his swing. The same scout said that Heyward will still hit the ball a long way if he can extend his arms to hit a pitch over the plate. But he has only three home runs this year, and his slugging percentage is .326, or 101 percentage points down from last year. Haven't heard this mentioned much because he gets on base but where has Heyward's power gone? Is it simply that pitchers have adjusted to him inside and he hasn't adapted? Can't see the Braves trading any young pitcher, for this reason: Santana, Harang and Floyd are all on one-year contracts. There's no guarantee Medlen or Beachy will ever make it back as starting pitchers. They're going to need Minor and Wood and probably Hale just to fill out a rotation for next season and beyond. teheran seems to be the only braves pitcher with some consistency. any chance they move wood or minor to help rotation? or what we have what we'll have? I'm sure they'd be willing to listen to anything at this point, Mark, and that's the position in need of most help. Just not sure there's a match to be made involving Uggla. I think the Braves are going to have to eat the remaining years of that contract sooner or later. Do the Braves entertain a deadline deal for a 2B or no? Hope that helps, Ray. Not sure it did, though. take me into fredi's mind. why wouldn't he pull thomas after he got in trouble? The rain delay did the Braves no favors. They surely would have brought Alex Wood -- the other lefty reliever -- back to start the seventh, but you really don't want to have a young pitcher go back into a game after not throwing a pitch for 90 minutes. That said, the Braves had to know the rain was coming. They have radar and computers and TVs and stuff. Also it was getting really dark. We asked the same. Never got a great answer. I know Fredi was reluctant to bring a different lefty reliever in to face Ortiz -- had he done so, he'd have been out of lefty relievers -- but I think the big move was in using Thomas to start the inning with the game tied, as opposed to Avilan. Hello. It's Mark Bradley, here to entertain Braves-related questions and perhaps even answer one or two. 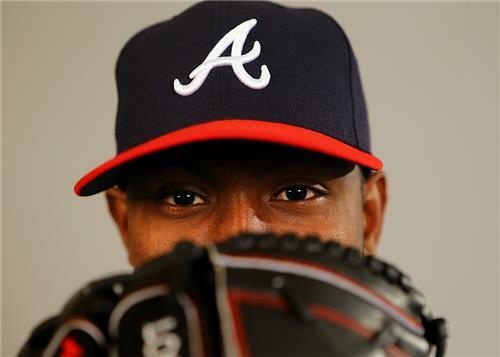 Julio Teheran (2-3, 2.20 ERA) takes mound for Braves tonight against the Brewers. That's all for now folks. Heading to the stadium soon. Thanks. @SLC10: I tend to agree on Pastornicky and Pena but I don't see Wren investing heavily in 2B. I see Patornicky and Pena as utility players and not starters at second. Is WRen looking at acquiring a 2b or is he looking for more from La Stella before a possible callup? @CraZy: Yes. I've got huge biceps. Is it fair to say you're the Uggla of sports writers?? @BooBooBear: Football. Also relatively isolated situation. The palace Jerry Jones built is in Arlington, not close to downtown Arlington either. @DubyaCubed: Agree that city dropped the ball not developing around Turner Field. Jef, it always surprises me how everyone is shocked of the braves move to Cobb. I travel a lot for work and have been to games at about 12 parks. While the Ted ranks up there in the top 5 parks, it is last in area surrounding. @Hugo: Yes but not sure how long term it is off hand. Do these people asking you about dumping Fredi realize he just signed an extension? The amateur draft is coming up soon. Do you know of any players the Braves are hoping to draft? @BatMasterson: Haha. ... on Twitter ... lately ... yes. Are you haunted by the commenter named Birdhair? @Loren: Certainly better than Gwinnett merely because of population/traffic around 285/75. But not sure it will be smashing success they project. How likely do you think it is that the Cobb Braves' mixed-use development promises will end up like the Gwinnett Braves' mixed-use development promises? @ChipperJoneswannabe: He's probably next option. Why not try Simmons in the leadoff spot? After all, he did win a batting title in the minors batting mostly leadoff. @Jeremy: As far as starters go: anybody but Teheran. If you HAD to propose a trade dealing one of our pitchers for a hitter, what would it be?! At least give the pitcher you would trade. I'll take a few more folks. @Google: At least Frank Wren never signed Damian Rhodes to be his backstop. Don Waddell failed to win a playoff series in 11 years and had to build a team from scratch. When can we begin comparing Wren to Waddell? @wanderboyd: Correct -- when Braves considering keeping him Boras/Bourne were asking for the moon. His price only came down later. @Robert: If there is a lingering health issue, it's a secret.